How children and teens think about and understand their time is important to developing healthy routines and time management skills, now and into the future. 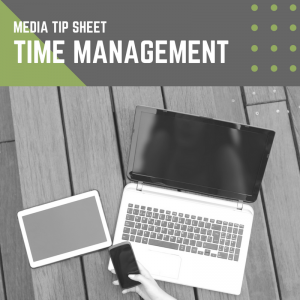 This tip sheet will help you understand how media can positively and negatively affect children’s understanding of how they use their time. Use this information as a guide to help you choose and monitor media that are best for your child. Media can be a healthy part of a child’s life when balanced with other activities, like sleep, family meal time, social time with friends, outdoor play, reading books, and completing homework. Excessive media use can cause issues in children and teens, including problems with weight, sleep, anger management, and poor school performance. Some of these problems can last into adulthood if not addressed. Children who are likely to have or develop mental health issues are more likely to turn to media and may spend unhealthy amounts of time in front of screens. Help your child maintain a healthy balance of media and non-media activities in their daily lives. Be a time management role model. Make sure to have media-free times in your day, and show your children and teens that they don’t need to be online at all times. Be mindful of your child’s needs. Monitor their media use and set boundaries when needed.